Q. Is there a way to “check out” a document section rather than a whole document in SharePoint? A. If multiple people should only be editing certain sections of a document simultaneously, and you are concerned about “cross contamination,” you could try using Restrict Editing. Highlight a section of your document intended to be edited by only one person. Click Restrict Editing on the Review tab and check the Editing restrictions box. Click on more users to add specific user names or email addresses that may access that section. When you click the Yes, Start Enforcing Protection button, you’ll be asked to provide a password. Even though the password will be the same, only the authorized individuals should be able to edit their section. If multiple people can edit multiple sections, but you just want to control each section, I’d suggest using a Master Document. 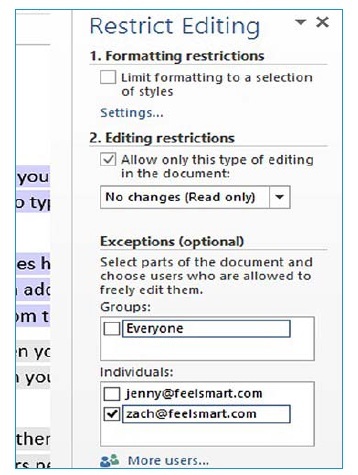 Create individual documents for the “sections” and set the library to only allow Check in/Check out editing. When everyone is done, you can combine them all using a Master document.